Yeah, this is a pretty obvious one. Gillian Welch’s fourth album took on a wider palette – drums, organs, electric guitars – and some of her best songs. Sad though, in that it’s seven years since Soul Journey was recorded and with no new album in sight, I’ve pretty much written her off. How great it was though, when I first put this album on. From a career full of impossibly beautiful songs, this album opens with Look At Miss Ohio, a song it seemed that people started cover almost immediately. It started off as classic Gillian Welch, but then a minute or so in, there’s drums! Looking back, all those additional instruments aren’t that shocking. They serve the songs, and they weren’t missed in a live setting. Wrecking Ball, Wayside – all worked well with or without drums. The two best songs are not only without drums, they are mostly without David Rawlings, her long time guitar player/producer. The Welch only recordings – No One Knows My Name and I Had A Real Good Mother And Father – share a theme, alluding to Welch’s own life as an orphan. Then there’s One Little Song, as much a manifesto as anything she has ever written. So we can only imagine how this new sound could have evolved. This year we got a debut album by Dave Rawlings, which gave us some clues. It would be so great to hear a new album, but word is they aren’t even close to starting. I’ve seen this album on many best-of the decade lists, and how can it be denied? 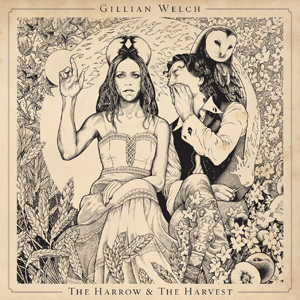 Gillian Welch jumped into a new stratosphere. The limits to what could be done with old-timey, traditional American music would be forever challenged. Time (the Revelator) was all this and more. 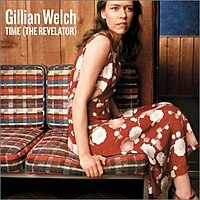 Gillian Welch (and her partner David Rawlings) had made two albums of honest, down home bluegrass with T-Bone Burnett. Steeped in the past, the albums were black and white vignettes. They sounded like classics that have existed for all time – and songs were covered immediately by people like Emmylou Harris. Collaborations with people like Ryan Adams had brought their profile up, but there was one more important step they had to take before Time (the Revelator) was released. O Brother, Where Art Thou? was the new Coen Brothers film. Always sticking to their quirky, one of a kind vision, they comissioned a soundtrack of old timey music of many sorts – bluegrass, mountain ballads, gospel and blues. It had been years since anything of such a sub genre had ever been a hit, even a minor one. To absolutely everyone’s surprise, the album sold 8 times platinum (could well be 9 by now), and became an actual hit record! Welch served as one of the musical directors on the album. One of the performances on Time (the Revelator) is taken from the live showcase of the OBWAT soundtrack at the Ryman Auditorium in Nashville. It was captured on the film Down From the Mountain. Suddenly, there was an large audience for banjos, finger picking and close harmonies. If they had made another album like the two before, it would have captured the moment, made some money, and Welch would have followed the genre back into obscurity. By luck or design, they had an album that was far more than the albums they gave us before. Tim (the Revelator) opened with Revelator. Had there ever been a 6 minute plus mountain ballad about betrayal that ever came close to sounding like this. The story continued with My First Lover. Sounding like the past, it quickly gives itself away as a contemporary story with references to Steve Miller Band. It’s that hint of modernity that is so disarming. It’s like using an old dead language to describe todays events. I Want To Sing That Rock N Roll, Elvis Presley Blues… songs that sound like this should not be singing about stuff like that. Rawlings was a revelation in himself. Taking production duties himself, his guitar work is original and phenomenal. Not relying on anything remotely like a classic country lick, it added to the spookiness of the proceedings. And like Highway 61 Revisted before it, it ended with it’s longest track. An almost 15 minute road trip called I Dream A Highway, rolling the album back into the darkness from where it first appeared. I am still very much in love with the work of this duo. And it was around here I fell for old timey things. On the street where I lived, King Street in Newtown, Sydney, there were a couple of awesome antique shops. Old coffee tables, lamps, record players, couches… I love it all. This fit right in with me. Traditiona and modern at the same time.